Arrow commands extraordinary brand recognition for its fashionable yet functional apparel – like its famous shirts – and consistently ranks in the top 50 in consumer brand awareness in the United States. 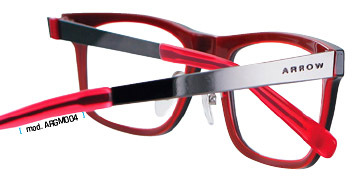 The elegant and stylish eyewear associated with the label is now distributed by Importlux. “We are very excited to introduce Arrow to the Canadian market. Its quality design matched with its competitive price point will be a great asset for our customers,” says Importlux President Ramez-Raymond Tarazi. The collection consists of 25 metal and acetate models for men, with sophisticated and elegant styles all in a trendy fashion. Current and timeless, chic and original, the Arrow models borrow ready-to-wear details and impose a whole new vision of the classic eyewear. The line also includes a range of titanium frames with deep and comfortable shapes matched with an incomparable finesse and refined colour treatment.